Passed away peacefully on Wednesday 23rd January 2019. Dearly loved Husband of Linda. Loved Father and Father-in-law of Debbie & Rod, Lynette & Phillip and Glenn & Rochelle. Cherished Grandfather of Krystle, Matthew, David, Sarah, Joshua, Mitchell and Emily. Loving Great-Grandfather of Piper, Jack, Chelsea, Ryan and Cooper. Loved Brother of Will (dec'd), Daph (dec'd), Chloreen, Sid (dec'd), Ken (dec'd) and Norm. 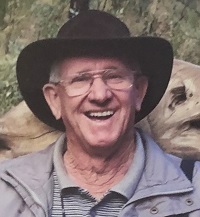 Family and Friends are warmly invited to attend Bob’s Funeral Service to be held at St Andrews Presbyterian Church, Wollumbin Street, Murwillumbah, on Thursday 31st January 2019 at 10.00 am (NSW). After the service, the cortege will leave for the Tweed Valley Lawn Cemetery, Eviron. In lieu of flowers, donations to the Heart Foundation would be appreciated, with a donation box and envelopes available.